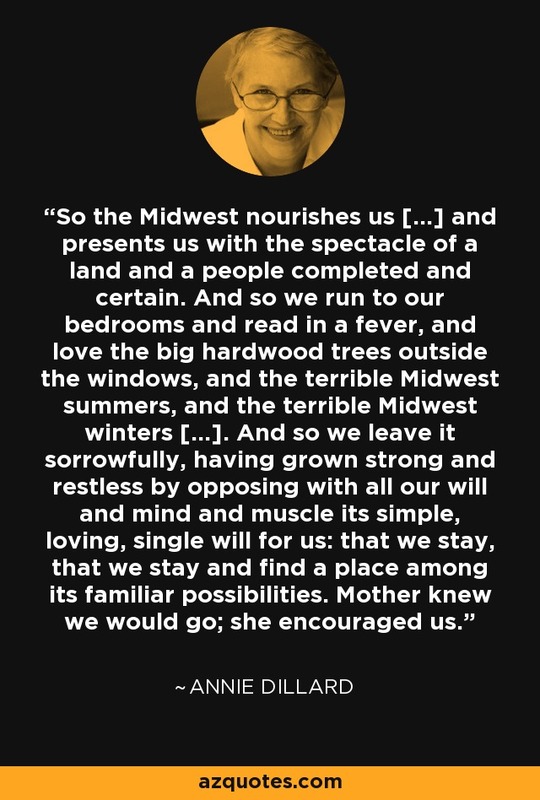 So the Midwest nourishes us [...] and presents us with the spectacle of a land and a people completed and certain. And so we run to our bedrooms and read in a fever, and love the big hardwood trees outside the windows, and the terrible Midwest summers, and the terrible Midwest winters [...]. And so we leave it sorrowfully, having grown strong and restless by opposing with all our will and mind and muscle its simple, loving, single will for us: that we stay, that we stay and find a place among its familiar possibilities. Mother knew we would go; she encouraged us.